Publish Service - now the plugin gives an option to import existing folders when the user creates a new publish service. Fixed the "The requested resource no longer exists on the server" error when republishing previously uploaded photos. Fixed the "attempt to call method 'getCollectionInfoSummary'" error when running "Import Albums". Added the option to automatically upload XMP sidecars when uploading proprietary raw originals. Fixed the issue with the filename conflict resolution on upload. The removal of person tags now works correctly when the Remove Person Info option is in effect. Reclaim photos: added now supports all raw formats that are supported by Lightroom. The plugin handles slower connections better and automatically extends the upload timeout when necessary. Fixed the "Yielding across C/metamethod is not allowed" error when quickly switching between publish providers or export presets. Export: Fixed the issue with uploading new versions of existing photos. Fixed the "Error processing server response" when re-publishing photos. Selecting the top folder for the album hierarchy is more intuitive now. Publish Service: added the ability to map the folder hierachy to any folder (previosuly there were only two choices: root folder of the account or the Photos folder). Improved sanitizing of filenames starting with a dash character. Fixed the "attempt to call global 'bind' (a nil value)" error. Export Dialog: improved album caching. New upload API endpoint. Earlier plugin versions will not be able to upload after Septermber 15th when Box disables the old endpoint. Fixed a rare "Method Not Allowed" error when re-publishing photos. 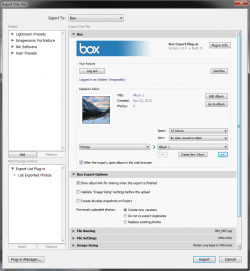 Reclaim Photos - now you can download photos from Box to your hard drive. Import Keywords - now you can import Box tags as Lightroom keywords. Synchronize Metadata - enables you to export Lightroom keywords to Box without having to re-upload photos. Added support for keyword tags. Now when you upload photos, Lightroom keywords appear at Box as tags. Improved handling of large file uploads and reduced the odds of time-out errors. Improved handling of Box API specific errors. Fixed the "Method is not allowed" error when the required "Photos" folder is missing at Box. Fixed the issue with applying plugin updates. Fixed: The plugin sees only first 100 albums in the account. Migrated all Box API calls from V1 to V2 (the older API is being deprecated and soon will cease to work). Now supports auto-expiration for shared album links (Starter, Business, and Enterprise accounts only). Create Album - improved the validation of album settings. New installer for Mac OS. Extras - Import Album Structure now imports empty albums as well. Fixed an infinite loop when retrieving alums in some rare situations. Create Super Album - fixed the error when no albums or album set are selected. 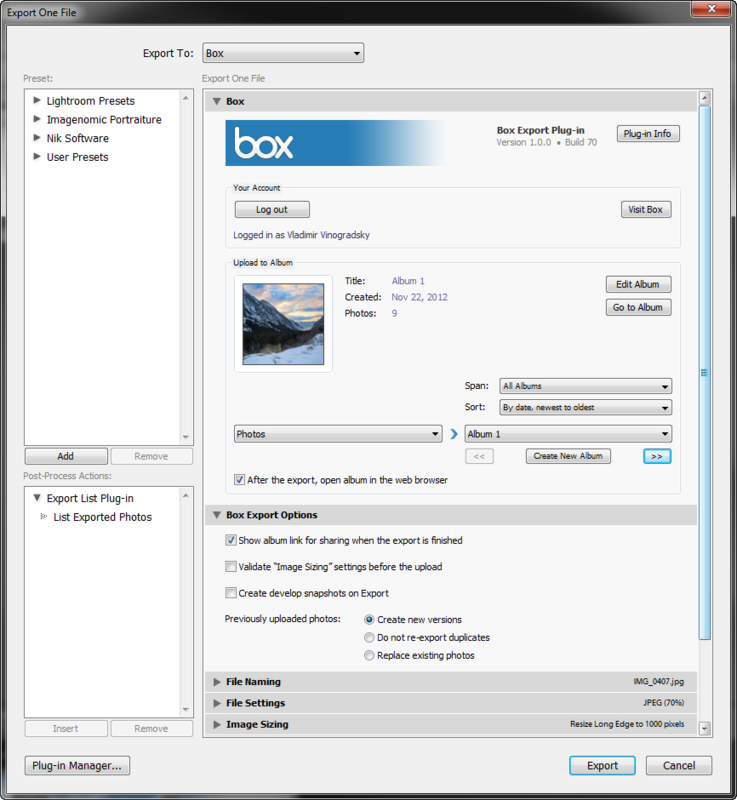 Due to the Box API V2 requirements, the plugin is no longer compatible with Lightroom 2 and 3. Added the ability to upload photos in TIFF and original (RAW) format. Added support for AdobeRGB, ProPhoto RGB, and other color spaces. Extras - Associate Photos: Added a new method of resolving matching conflicts - now you can prioritize pairing of rendered copies (JPEG and TIFF) over raw originals. Extras - Associate Photos: Added new matching method "By File Number Suffix" which compares only numeric image suffixes when searching for candidates. Improved compatibility with the recent changes in Box API. Fixed the "Unauthorized" error when the previously obtained security token expires. Fixed the "Not found" error in some situations when synchronizing photo comments. Fixed the "bad argument to 'gsub' (string expected, got table)" when re-publishing deleted photos. Improved handling of situations when the Photos folder does not exist. Extras: The photo matching algorithm has been significantly improved to provide a faster and more accurate matching, particularly when file names contain spaces and other non-alphanumeric characters. Video Uploads: Cleaned up video format options.